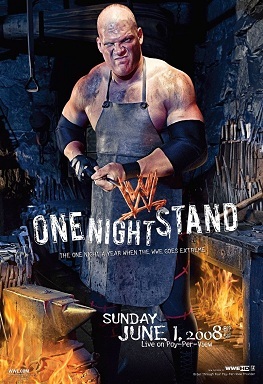 Resultados do Wwe One Night Stand '08 - . ::Wrestling of Pain::. Edge venceu Undertaker, num TLC match, tornando-se assim o novo World Heavyweight Champion. Wwe Champion Triple H venceu Randy Orton, num Last Man Standing Match. John Cena venceu JBL, num First Blood Match. Batista venceu Shawn Michaels, num Stretcher Match. Jeff Hardy venceu Umaga, num Falls Count Anywhere. Big Show venceu o Wwe Tag-Team Champion John Morisson,Tommy Dreamer, Chavo Guerrero e CM Punk, num Singapore Cane Match. Beth Phoenix venceu Melina, num I Quit Match.